When I was born, Souderton Mennonite Church met at Christopher Dock Mennonite High School for our Sunday morning services because our church building was being renovated. My mom recalls that because there was no nursery, she would have to go out in the car to quiet and feed me when I cried during the service. 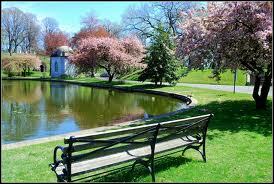 As a young girl, I went fishing on the pond at Dock along with my dad and my brother. I was too young, and perhaps the wrong gender, to have a fishing rod, but I found a stick and attached some fishing line to drop over the pond’s edge and catch a 7-inch bass. My dad was shocked, especially since he and Steve hadn’t had any success. From then on my dad let me use a fishing rod. I learned to love the arts at Dock. Some of my earliest memories are of coming and going to CD music and drama programs. When my sister Linda was in the junior play To Kill a Mockingbird as Mrs. Merriweather, I was eight years old and the television set was not yet prominent in our home. I sat enthralled at the Dock performances; so much so, that my “movie stars” became the junior play’s main characters, such as, Jane Wenger as Scout and Yvonne Meyers as Christy. Being entertained at the CD programs was a highlight for me as a young girl and I lived for the next event. When I began attending Dock in 1975, I was drawn to the drama and music that was offered. I remember Ms. Beth Ranck selecting me to portray Helen Keller in the Miracle Worker and instructing me to spend a day at school blindfolded so I could experience what it felt like to be blind. Being a part of dramas was like a childhood dream come true and I thoroughly enjoyed the camaraderie involved with a large group of people working and performing together. Through Mr. Gerald Benner, Steinbeck’s Grapes of Wrath came alive and with the assistance of Ms. Lois Driver, I entered my first writing contest and I began to see the power and catharsis of the written word. It was through these teachers’ encouragement that I majored in English after graduating from Dock in 1979. When I finished college, I naturally wanted to return to the nurturing place of my youth and relive the joys of being part of the CD community. Unfortunately, teaching at Dock was much more difficult than any of my previous experiences. But with the passing of years, the faces of the student body, faculty and administration continue to change and it’s hard to stay bitter about a place that has nurtured me all my life. In 2003, our oldest child began attending at Dock and when our daughter graduates in 2014, it will be eleven years of watching our children grow spiritually, watching them challenged by social and service opportunities, and watching them develop emotional maturity at Dock. They reflect the traditions and values of their Mennonite heritage and the Mennonite community that raised them. Dorothy (“Dotty”) Dayton remembers being thirteen and wanting to go ice skating, but feeling guilty because her mother was very sick in bed. She wanted to be by her mother’s side, as she had for as long as she could recall, but she also wanted to go out and be with her friends. Dotty was one of eight children born to Virginia (“Virgie”) and Jacob Clarence (J.C.) Steinly. 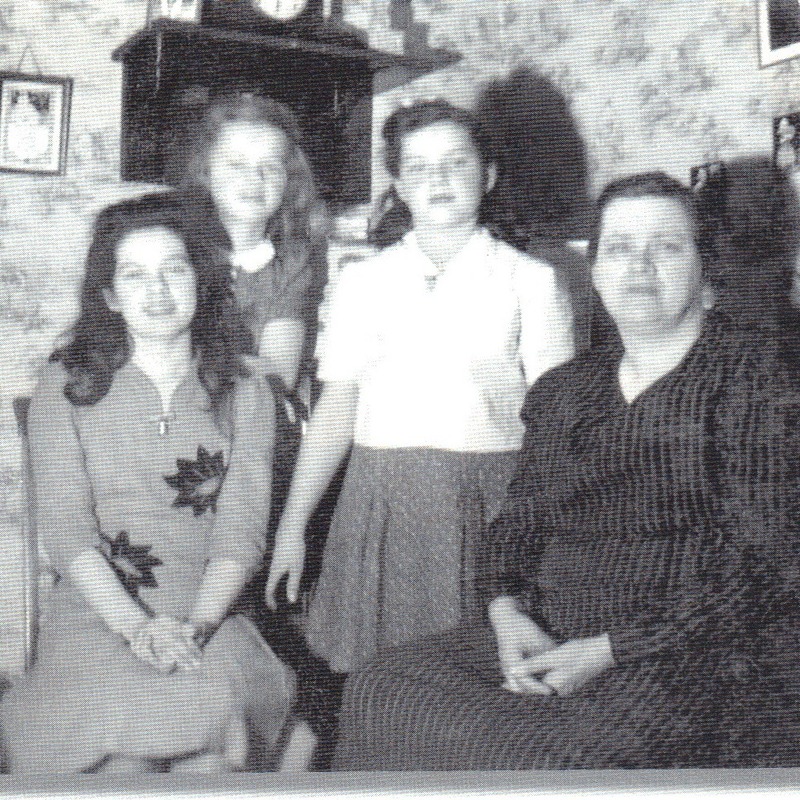 Kathryn, Dotty, and Betty were the three youngest daughters, and they were very young when their mother became ill with multiple sclerosis (MS). Virgie began feeling the effects of this disease when she was thirty-three and pregnant with her sixth child. Her first symptom was dragging her left foot as she walked, but eventually the paralysis spread throughout her body. It was not until 1945, when she and J.C. traveled to Maryland to visit with a doctor at John Hopkins Hospital, that her illness was diagnosed as MS. At the time, the family had high hopes that Virgie would get better, but their hopes were dashed when they found out that there was no treatment available. When Kathryn, Dotty, and Betty were teenagers, they started singing together as a trio at the suggestion of Leidy Hunsicker. They sang at local churches and at James and Ethel Clemmer’s wedding. Neither one of their parents was ever able to see them perform, but they sang songs like “I’d Rather Have Jesus” by George Beverly Shea. The girls did sing for their parents at home and their parents loved to hear them sing, “This World is Not My Home.” But their sister, Kathryn, soon got married, and their singing career came to an end. Wayne, one of the older Steinly children served in the Air Force during World War II, and to this day remembers the many letters his mother wrote to him while she was confined to her chair. It couldn’t have been easy for Virgie and J.C. to see their son go into the military, but Virgie continued to pray and write letters to her son faithfully. Wayne could see by her handwriting that “it was very difficult for her to write,” but she never tired of sending her love and support. Tragedy struck the Steinly family in the winter of 1954, when Virgie and J.C.’s youngest son, twenty-nine-year-old Jacob Clarence, Jr. (nicknamed “Shrimp”), was killed in an accident. He was in a truck loaded with oil, making deliveries for his dad’s business (J.C. Steinly and Son) late into the afternoon, because oil prices were going up the next day. He was trying to avoid hitting a tractor trailer by turning toward the curb, but couldn’t avoid the collision and was killed instantly. In the days and weeks following this accident, Dotty and Betty remember their mother as the strongest of them all. She was totally helpless, confined to her bed, but repeated the verse “All things work together for good,” and kept the family from becoming bitter about their youngest son and brother dying at such a young age. Toward the end of Virgie’s life, she became very uncomfortable in bed and called on her husband and Dotty often, wanting to be turned from side to side. A nurse came to the Steinly home once a week, but the rest of the responsibilities fell on Dotty and J.C. Some even said that was the reason Dotty didn’t marry till she was in her thirties. Dotty admits that she wanted to stay home with her mother after her sisters got married. Dotty concludes, “When the Myron Augsburger Tent Crusade was held in Lansdale, our mother requested that her testimony be put on tape and played at the crusade.” The following is Virgie’s testimony which was played at the crusade and also given out at her funeral in 1963. “I have learned in whatsoever state I am therewith to be content. I am never alone; the Lord is with me. The Lord means more to me than anyone. I love everyone. In Psalm 119:71, David said, ‘It is good I have been afflicted because I have learned so much about Thy Word.’ I have found that in my life. I think we have a wonderful God. He is great; he is all-powerful. Praise His Holy Name! He is a God of love and full of tender mercies. His Son Jesus is my Savior. For to me to live is Christ and to die is gain. I am crucified with Christ, nevertheless I live, yet not I but Christ liveth in me. The life that I now live, I live by the faith of the Son of God who loved me and gave Himself on that cruel cross for me. I can do all things through Christ which strengtheneth me. I cast all my cares upon Him, for He careth for me. I commit my all to Him, put all my trust in Him. I reckon the sufferings of this present time are not worthy to be compared with the glory which shall be revealed unto us. I know my Redeemer liveth. He knoweth the way that I take, and when He hath tried me, I shall come forth as gold. Lord, not my will but thine be done. ‘To God be the glory, great things He hath done.’ Yes He has. Amen. What makes a woman commit suicide at 36 with young children, a beautiful home, and a husband that provides for the family? Emotional abuse could be the reason. What makes a man leave his wife of 30 years because he can no longer stand to be in her presence? 1. Does the person use physical force or threats of force to make you do something you don’t want to do or to keep you from doing something you want to do? 2. Does the person use verbal weapons such as cursing, name calling, degrading comments, constant criticism, or blaming to get you to do something you don’t want to do or to keep you from doing something you want to do? 3. Does the person curse at you, call you names, humiliate you in public, or degrade you when he or she is unhappy with something you do? 4. Does the person force or manipulate you to perform sexually in ways you do not want to? 5. Do you ever feel afraid of the person? 6. Does the person yell, scream, curse, or hurt you physically when he or she is frustrated or angry? 7. Does the person threaten to alienate your children from you or use them to intimidate you into giving in to what he or she wants? 8. Are you afraid to disagree with the person? 9. When you share your thoughts and feelings about something important to you, does the person ignore you, make fun of you, or dismiss you? 10. Are you verbally and/or physically abusive toward the person? 11. Does the person always think he or she is right to the point of arguing with you until you concede or give up? 12. Does the person make most of your decisions for you? 13. Does the person control the family money, giving you little or no say? 14. Have you given up things that were important to you because the person pressured you? 15. Does the person pout or withdraw from you for extended periods of time when he or she is angry or upset with you? 16. When you ask for a time out or don’t want to talk about something anymore, does the person keep badgering you to engage? 17. Does the person lie to you? 18. Have you observed the person lying to others? 19. Does the person tell you something didn’t happen when you know it did? 20. Does the person question or challenge your certainty of what he or she said or did? 21. Does the person depend on you to meet all his or her needs? 22. Do you feel more like a child than an adult in the relationship? 23. Are you emotionally devastated when the person is upset with you or doesn’t want to be in relationship with you? 24. When you try to talk with the person about your feelings or something that’s bothering you, do you end up feeling like the trouble is entirely your fault? 25. When the person does something wrong, does he or she blame you or anyone else for it? 26. Does the other person make excuses for his or her behavior (anger, jealousy, lies)? 27. Do you feel loved and cared for in the relationship? 28. Can you safely express an opinion that is different from the person’s? 29. Does the person show interest in you and your needs? 30. Are you able to express your honest thoughts and feelings with the person? 31. When the person does something wrong, does he or she admit it and take responsibility for it? If you answered any question up through question 25 with anything other than never, you are likely in an unhealthy relationship. Questions 27–31 describe the basic elements of a healthy relationship. If you answered never or seldom to any of these questions, your answers indicate that your relationship is unhealthy and probably destructive. If answering this questionnaire has revealed to you that you are in an abusive relationship, please seek appropriate help from those in your church or community who are experts in helping victims of abusive relationships. Her body quickens to answer my beckoning call. but directs my wandering steps. Something about spring and poetry go together. When I recently had a day off from work in early March, I hung out laundry, something I hadn’t done in months. There was a welcome, but unusual smell in the air. It was faint, but definitely, unmistakably spring. Yet over by the line of trees there was still a lingering reminder of winter, persistently visible: a border of snow. It was a day between winter and spring, but oh how invigorating, how awe-inspiring, how poetic. Life seems too full of many “promises to keep,” yet hopefully we still have time to marvel at the green shoots pushing up underneath the brown, winter-laden foliage. I hope we never cease to be amazed at the sight of the first daffodil, preceded by the first robin coming “down the walk.” The green resurrection around us encompasses our celebration of Christ’s resurrection. May we bear witness to this resurrection power and grace as we live and breathe the poetry of spring. This past winter when I thought I couldn’t stand it any longer, I decided to get away and visit my girlfriend, Peggy, in Chicago. Since I had invited myself, I told her I would get a room at a local bed and breakfast for a few days and see her whenever she could fit me in her schedule. The thinking was that I would have time to work as well as see Peggy. 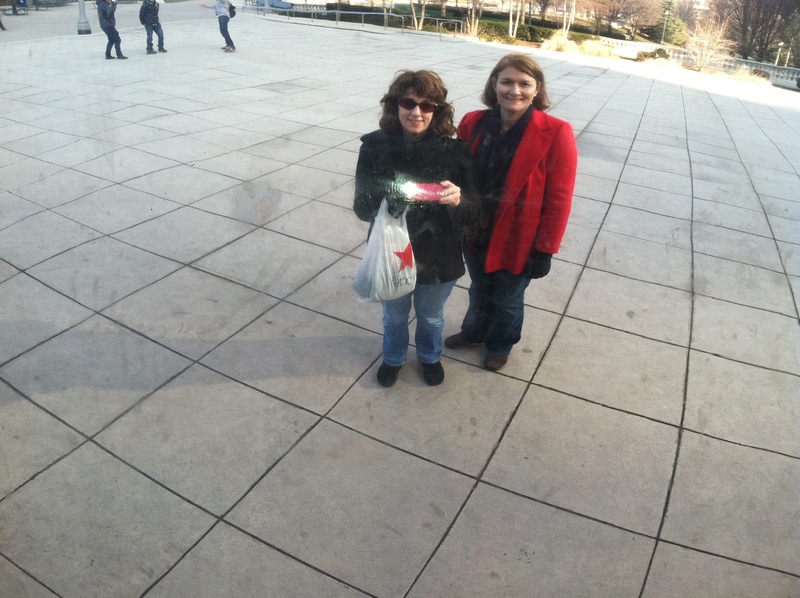 Well, Peggy was usually ready to do something soon after all her kids left for school, so we took one day to see the sites in downtown Chicago including the highly polished kidney bean called Cloud Gate and took another day to pick up Peggy’s daughter at nearby Trinity University. We ate lunch every day together, trying a variety of ethnic restaurants and saw all the local Oak Park museums, from Frank Lloyd Wright to Ernest Hemingway. I stayed at an old Victorian B&B hosted by Gloria, a kindred spirit. Over breakfast we listened to each other’s writing adventures and we soaked in each other’s reassurances. Gloria was the one to tell me how she confidently wrote a play and had it produced at a nearby theater. She told no one about it….because she said, “Everyone will try to talk you out of it.” She just went to her special “saint room” and wrote and it was as if it was blessed by Saint Joseph himself. She had her family of grandchildren as her actors and she was the narrator. It was produced one night to a standing room only crowd. For some reason, this woman was like ambrosia to my soul. She was an energetic, warm host and I wished I could stay longer under her tutelage. Another added benefit of this trip was getting to know Peggy’s family better. We were the only female attendants at each other’s weddings, but the demands of our children and family had sequestered our friendship for many years. We still sent the obligatory Christmas cards, but we had very little contact and lost touch with each other’s daily personal struggles that often keep friends bound together. So on this trip I got to talk to and spend some time with her oldest twins, Jessica and Amanda, and her son, Ryan, her husband Jon, and even their guide dog, Hunt. It wasn’t enough time, but it did provide a glimpse into Peggy’s life that I thoroughly enjoyed. How we have changed since our college days…how we have grown and matured and in some cases, become hardened to life’s cruel twists. 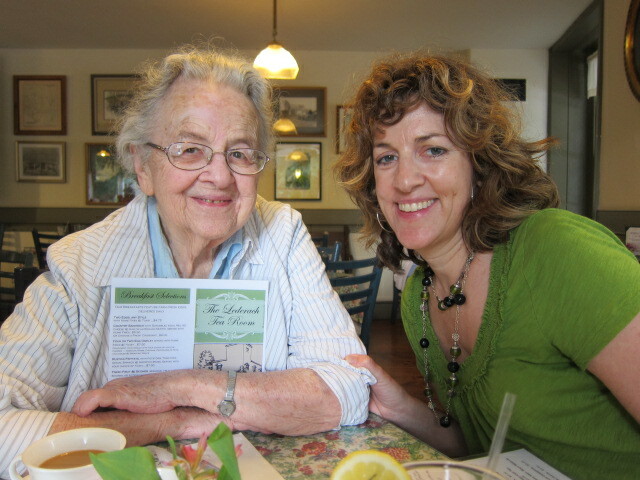 How wonderful to reconnect and witness first-hand the daily joys and sorrows that make up Peggy’s life. “Nobody can do it like McDonald’s can, “ but then who would want to? Feelings such as these come to mind when I think of this past summer. I was employed at McDonald’s of Souderton. I begged for more hours and higher pay, but hated every minute I spent there. Well, maybe that is a little strong. Let’s say, on the average, every other minute. My hours regularly ran from eleven AM to seven PM, Monday through Saturday. I spent my early mornings in dread of the approaching eleven o’clock hour. Luckily, by the time Phil Donahue was in its last commercial break, I had usually succeeded in pasting on my plastic smile and psyching myself up for another day at the “grease pit.” Then I quickly stomped on my Ford Torino gas pedal and did not look back till I reached the golden arches. If I was lucky, I got to be on a register to pant the orders given, in less than one minute’s time. But if I was unlucky, I had to do the breakfast dishes and then go out in the lobby to empty trash, clean windows and tables, fill napkins and straws, and sweep and mop the floor. Either way I was a goner. This is one of the many times when the question, “Why am I here” arose in my mind. This is a fatal phrase in all McDonald’s. It means that a customer has given an order but the product requested is not in the heated bin ready to sell. This causes the grill team to drop all the more hamburgers and rip all the more buns. But at least back on grill no grouchy customers can yell at you because their quarter pounder with cheese is too rare, that there is not enough hot fudge on their sundae, or that you charged them too much for their medium coke (to which you courteously point out that three cents tax is added). I found the greatest number of complaints to come between the hour of four and five. This is when groups of elderly women with pinched lips and pinched purses would order a plain filet-of-fish and a regular size cup of coffee. Then they would immediately flash their “Golden Arches” membership card. (This is a card given to senior citizens which entitles them to a free cup of coffee.) They then stared at the register till finally the all-telling digits appeared. If I happened to forget to subtract their cup of coffee, they would make it known with an indignant shake of the finger. One lady even stood at the counter for over five minutes, insisting that I had charged her two cents extra and demanding that I add it up again. At moments like these my plastic smile grew rudely artificial. I soon learned the rule that all the workers, even the managers, followed, “How to do as little as possible and still get away with it.” Guilt often pricked my conscience when I kneeled behind boxes in the stockroom to shove “Chocolately Chip Cookies” in my mouth, when I took a ten-minute break instead of the required thirty minute, or when I sat in the bathroom filing my nails. But it was ironic how everyone seemed to be doing it. The managers were unpredictable—you never knew which way to turn. At one time a manager would say, “Relax, take a walk around the parking lot” but at another time, “If you got time to lean, you got time to clean. Hop to it, Benner!” The only time when everyone was working as hard as possible and the managers were prodding us for better QSC (Quality, Service, Cleanliness) was when the supervisor made his monthly visits. 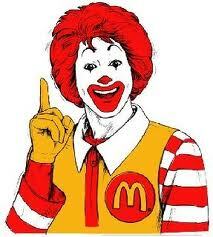 Now that I look back on it, I feel no antagonism towards McDonald’s, only pity for the slaves caught up in its system.